I didn’t like the look of this project right up until the very last bit of the binding was sewn down, and then after that I changed my mind. I like it now. It’s amazing the difference trimming threads and binding can make between “What IS this?” and “It’s a bag!” I’m starting to think that sewing is a bit like cooking – if you buy good enough ingredients you don’t need to do an awful lot to them, to make them shine. Having said that, despite following the instructions very very carefully, I’m not sure if I did the binding right. It doesn’t look great. I need to do more research on binding techniques, as well as more practice. 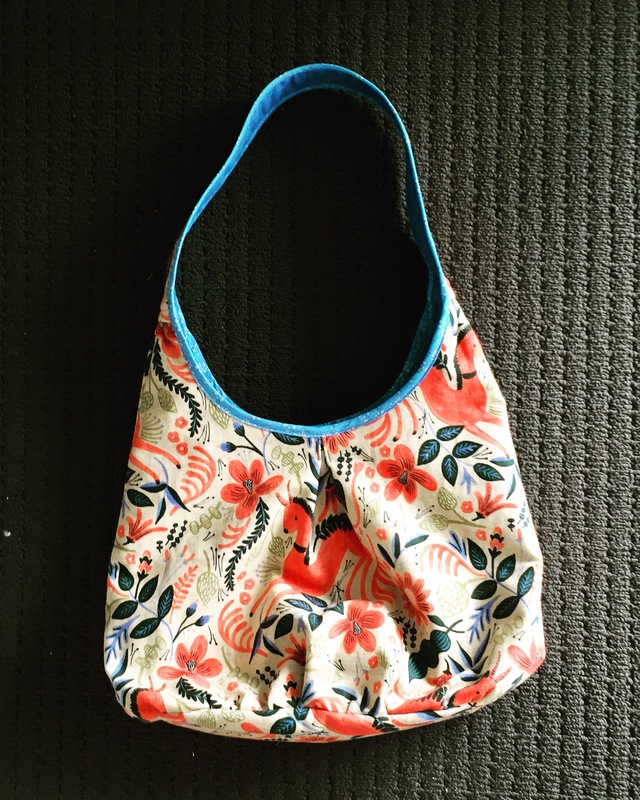 This bag is a gift for another friend, and I’m crossing fingers she won’t be inspecting the binding carefully(!). All in all though, for my first bag, I’m happy. I had so many questions (like, what kind of interfacing am I supposed to use if I can’t find the one that’s listed in the pattern materials? 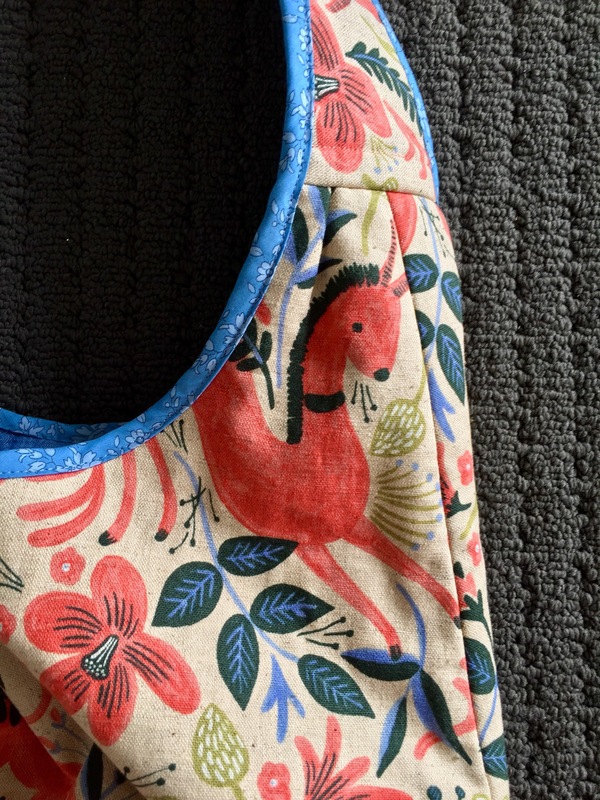 Does interfacing have a grain? And what am I doing wrong with the gathering, if my basting threads keep breaking?) but I decided to push on, and I’m glad I did. I think I was at least partially inspired by a Seth Godin interview I listened to this week, where he mentioned one of his life’s guiding principles was “it costs very little to find out”. He is so right (as he tends to be) – why do we let fear, and $20 worth of materials, stand in the way of finding something out? Interfacing: I wish I’d paid more attention to the interfacing I bought (off the roll at Spotlight, in a last minute decision), as I think it turned out quite well for this project. I think from the receipt it is called ‘Parlan Fusible Wadding, white’. No mention of the weight. Let’s hope I can find it again. Binding fabric: I bought a few metres of Liberty of London binding from Ava & Neve at the Brisbane Craft and Quilt Fair recently. I think this print is called ‘Capel’ but they don’t seem to have it listed on their website. Pocket fabric: I was please to have an excuse to use a scrap of Anna Maria Horner’s Illuminated Graph in Metallic Rust, from her Loominous collection of yarn dyed fabric. Loominous seems to sneak in to a lot of things I make. Snaps: these heart shaped leather snaps in light brown, from Studio Mio. Totally in love with these! No pun intended. 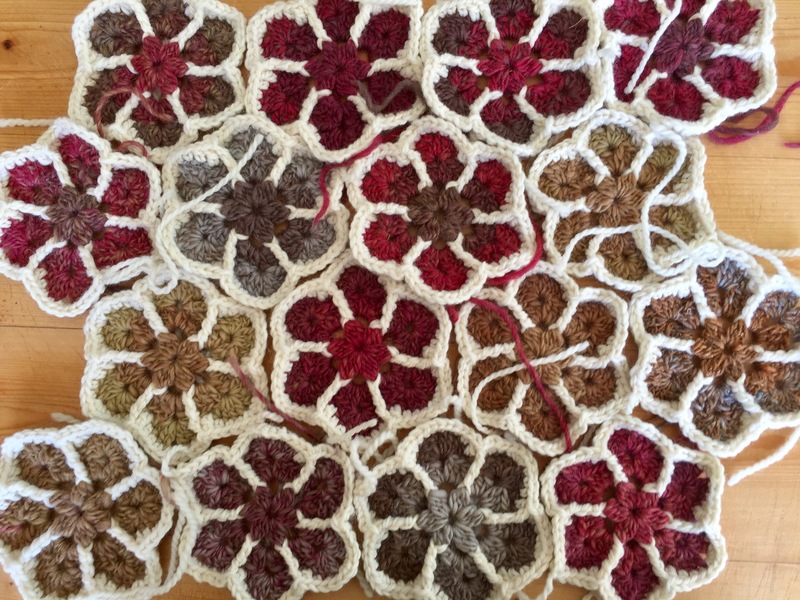 A constant companion of mine, these last few months, has been my Modern Blanket of Flowers project. 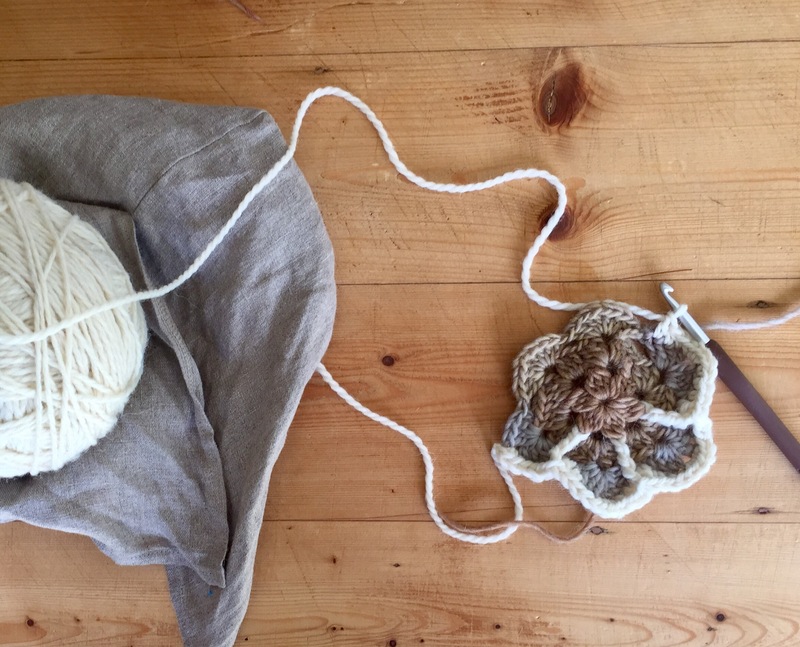 Although I know there are downsides to crochet blankets made from small component pieces (like, ends to weave in, for a start – ask me how I feel about those later), the tradeoff is being able to take a single ball of yarn, a hook, and a pair of scissors, and be happy wherever I go. 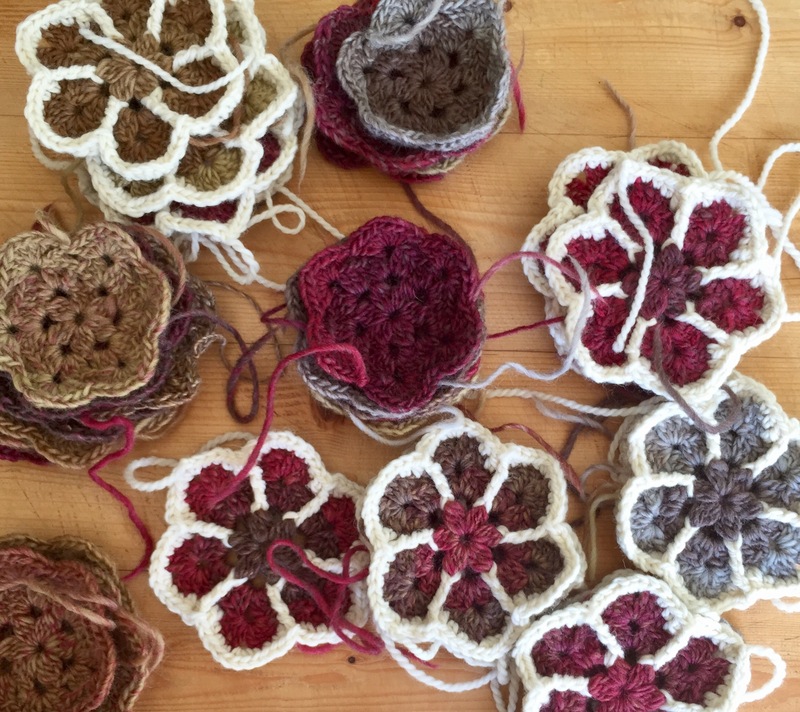 I only have a few more flowers to make, and I feel like I will actually miss them when they’re not in my handbag any more, and this turns from a take-anywhere project to a need-a-couch project. As many of my projects are, this one is a gift for a friend. She’s celebrating an important birthday this year, and lives in a cold place, where I hope this brings her warmth. 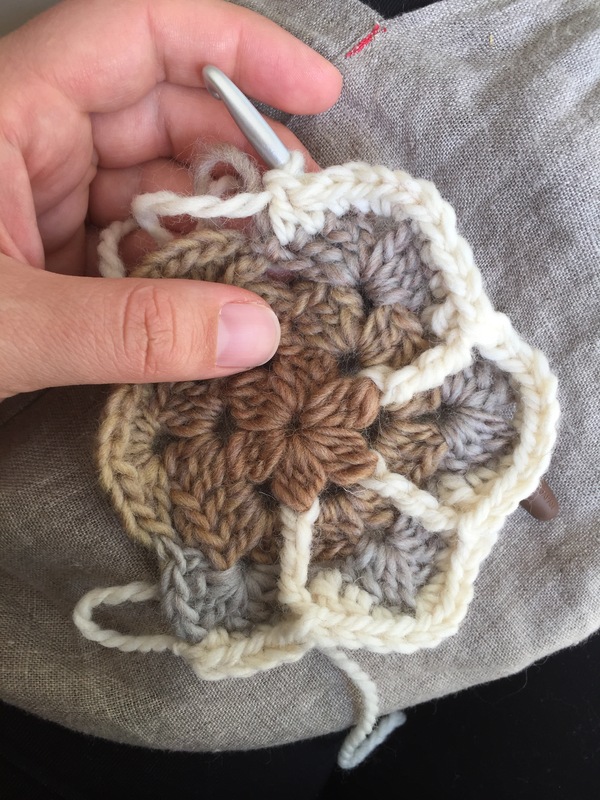 One of the reasons I like to make things for other people is that the making of them gives me time –in the case of a blanket, a LOT of time – to think about that person I love. I’m not sure if the recipients realise it (non-crafters, for a start, probably couldn’t even guess how much time goes in to the making of something), but it doesn’t matter. My relationship with them has been changed by the act of making. Deepened, considered more fully, appreciated anew by stepping out of the rush of regular time and into the flow-time of making. I remember hearing a knitting teacher say once that if she is standing in line or something and sees someone in a handknit sweater, she says to that person “Somebody loves you”. It is the truth, the whole and simple truth. And ultimately, it’s all I’m trying to say to this friend of mine, and any friend I make for: I hope this keeps you warm and safe and comfortable, but most of all, I hope you know somebody loves you. 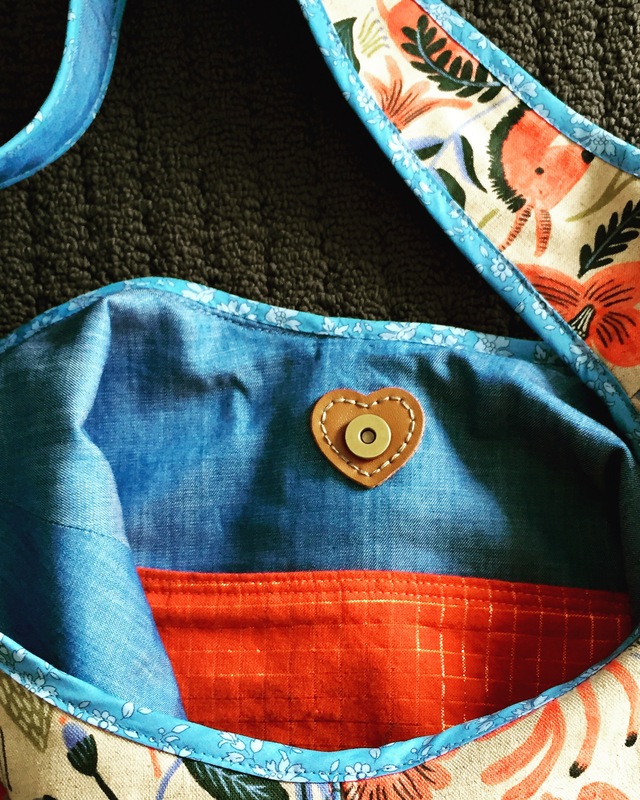 A few weeks ago I wrote this post about a fear of missing out generally, and a fear of missing one specific hand quilting workshop, in particular. And after writing that post I spoke to my husband, and we talked about life, and what’s important in it, and what our plans are for the future, and what my life’s been like for the last five years, and the end of all that was the swift, astonishing decision that I would travel to Melbourne, to travel to Lauriston, and go to the workshop with Felicia. For the first time in almost five years, I left my children and I spent nights away from them. Two nights. And for the first time in I honestly can’t remember how long (ten years, perhaps?) I travelled alone. How do I feel about all that? Two things: (1) I feel wonderful. I feel lucky, and delighted, and grateful. I savoured that trip in a way that I’ve never appreciated a journey before. And (2) I feel awful, because I very, very much want to do it again, and I don’t know when or how that’s going to be possible. Oscar Wilde said – and I don’t quite know how he understood the female psyche so completely, but it appears he did – that “every woman is a rebel, and usually in wild revolt against herself”. I realise that both are a privilege, the feeling of taking one’s bag and leaving, as well as the experience of coming home and being met at the gate (of, yes, an actual white picket fence) by a waggling dog, two ferocious knee-level pre-schooler hugs, and a smiling, tired, true love. I struggle to feel grateful for both – the home and the away – without desiring the balance to be different. And there is, it seems, no balance in parenting. 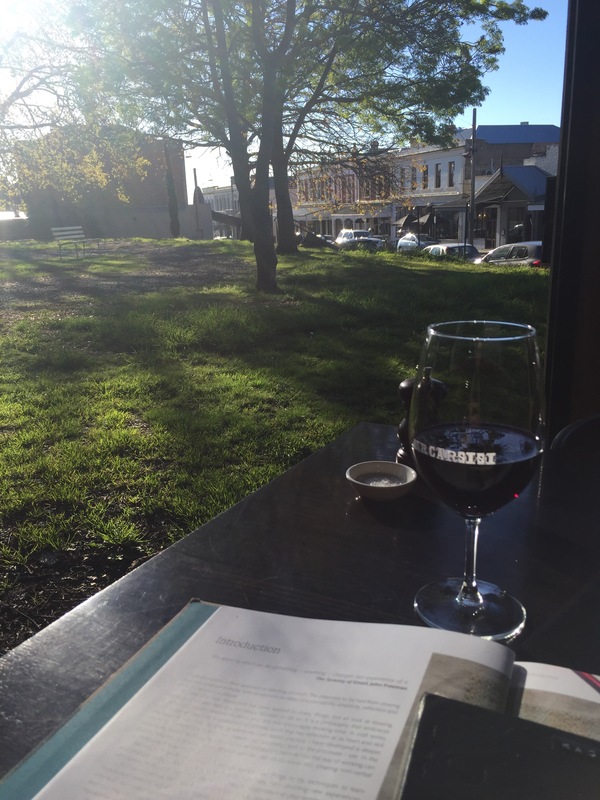 (As I am fond of saying, it would be the best job in the world – if only you got the weekend off…). Perhaps over the course of a lifetime, you obtain a balance between being swamped by the fact and presence of your children, and being far enough away from them to miss them, but in the first, say, fifteen years that balance leans heavily towards the former. At the beginning of the workshop we had the opportunity to introduce ourselves. My first sentence was something like “My name is Kelly, I have two young children, and I feel like making things with my hands is one of the only things that keeps me from going completely insane.” I didn’t overthink that sentence; perhaps if I’d reflected more I might not have chosen those words as my opening gambit to a room of strangers, but I’m so glad I did: there was an overwhelming chorus of “I’ve been there!”, “I remember those days…”, “Me TOO”. It was a pleasure to spend the day in the presence of others who understand. I went to Melbourne alone, and I found a place where I belong. So I did, I really did, start my first hand quilting project. And (of course) now that I’ve begun I have no idea what took me so long. It’s an interesting thing to do, if you have embroidered before. 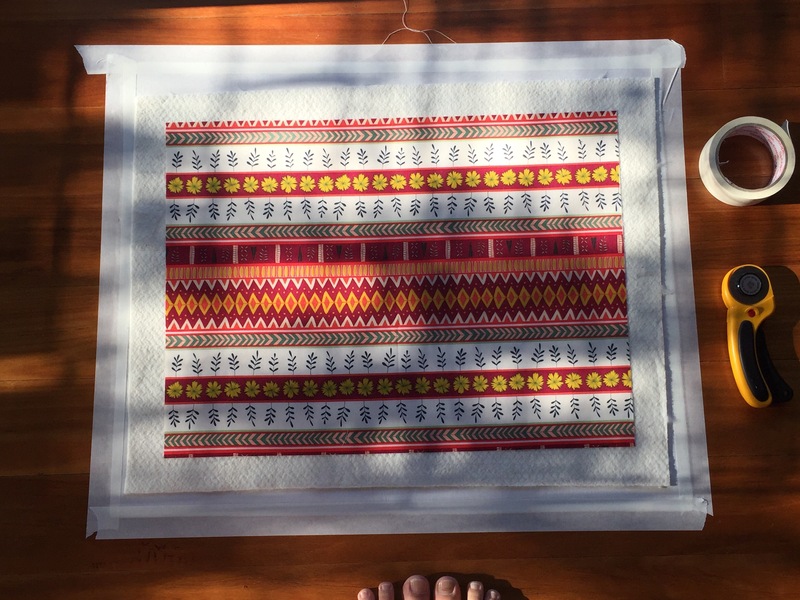 It feels so DIFFICULT – like fighting a battle with the fabric – compared to the relative ease of embroidery or cross-stitch. I was surprised how much like hard work it felt to my right hand, with all that pushing and pulling. I want to experiment with different needles, as I imagine the width of the needle makes a big difference to the force required. I am also using perle 8 cotton, so there are a few other options I can try (perle 12, for a start, or Aurifil 12 weight, which should be similar to the perle 12). Unfortunately, given my existing thumb and wrist problems, I need to minimise the force I’m exerting with my right hand, as much as possible. But oh, it’s so pretty, the end result. I like the look of the back almost more than the front, so far, which is good news for an actual quilt (rather than this cushion, which will have the reverse side hidden inside, of course). I love the look, and the feel, now I just have to work out how to do it without hurting myself. Regarding my fear of starting, it’s surprising how much fear comes into craft, or I think making art of any kind. I’ve been listening (and loving) my way through Elizabeth Gilbert’s Magic Lessons Podcast, and after a while you realise it’s generally the one same thing holding people back: fear. In fact, I’m pretty sure I heard her say that it’s “almost never not fear”. This morning’s episode involved an advertising executive who wants to be a storyteller, and Liz’s question to her was “Why are the things that bring us joy more frightening than the things that bring us drudgery?”. Now THERE’S a question. I wish I knew the answer. I do feel, somehow, that the older I get, the less time I am willing to devote to trying to impress other people, or make them happy (can anyone really make someone else happy?). In recent years a few things have happened to make me realise, in my bones, how brief our time here is, and how unpredictable the elements that we think we can control. When I painted and sketched (that would be in the distant past B.C. – Before Children!) I remember saying to my husband that nothing terrified me as much as a blank sheet of watercolour paper. Because it’s expensive – it costs, you know, $6! And I didn’t want to ruin it. But in some ways a blank sheet of paper that costs 2 cents, or is even free, is just as terrifying. Somehow the blankness, the whiteness, is perfect, in a way that anything I draw (or that any human draws) just isn’t. It’s this tug-of-war that plays out between the blank page, the fabric still on the bolt, the raw ingredients, and the deeply flawed and deeply human things we might do with those materials that makes art and craft (and dare I say, life) so interesting. 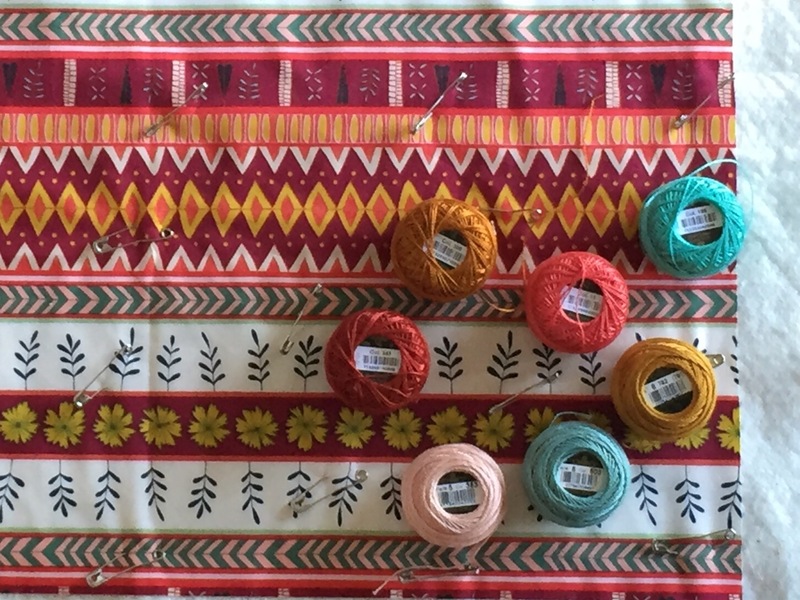 Thread: Anchor perle 8 cotton in colours 186 (turquoise), 308 (golden brown), 341 (rusty red), 11 (salmon), DMC perle 8 cotton in colours 503 (light turquoise), 353 (pale pink), 782 (781) (light brown). So I HAVE started my first hand quilting project, but I’ll save that to talk about in more detail another day. I wanted to pull together some of the links and information I’ve come across in my searching/researching, both so that I can refer to them, and also in the hope that it might be a useful resource for anyone else who might be interested. I first came across hand quilting via Anna Maria Horner’s Wholecloth Quilt class on Craftsy. She talks a bit about materials, and the technique she uses, before walking through an entire wholecloth baby quilt project (improvising by following the outline of a printed fabric). Sarah’s book Hand Quilting With Love caught my eye in my local quilt store, and also her youtube video on hand quilting with perle cotton. 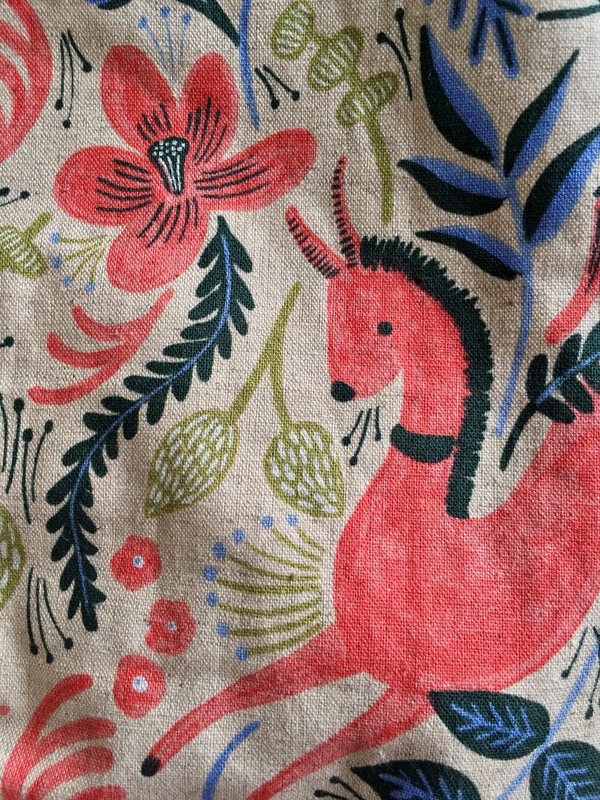 I was excited to find out that Carolyn Friedlander also hand quilts – I love her aesthetic. One of her most useful posts about it is this one about materials, but she has a number of other posts, tagged with ‘big stitch quilting’. Jen not only hand quilts but also hand pieces, which blew my mind when I heard her discussing it on a podcast. And yet – how did I think quilts were put together prior to sewing machines being widespread?? I have considered heirloom quilts in a whole new light since then. I haven’t found a place where Jen comprehensively discusses her tools and techniques, but this link might be the best. 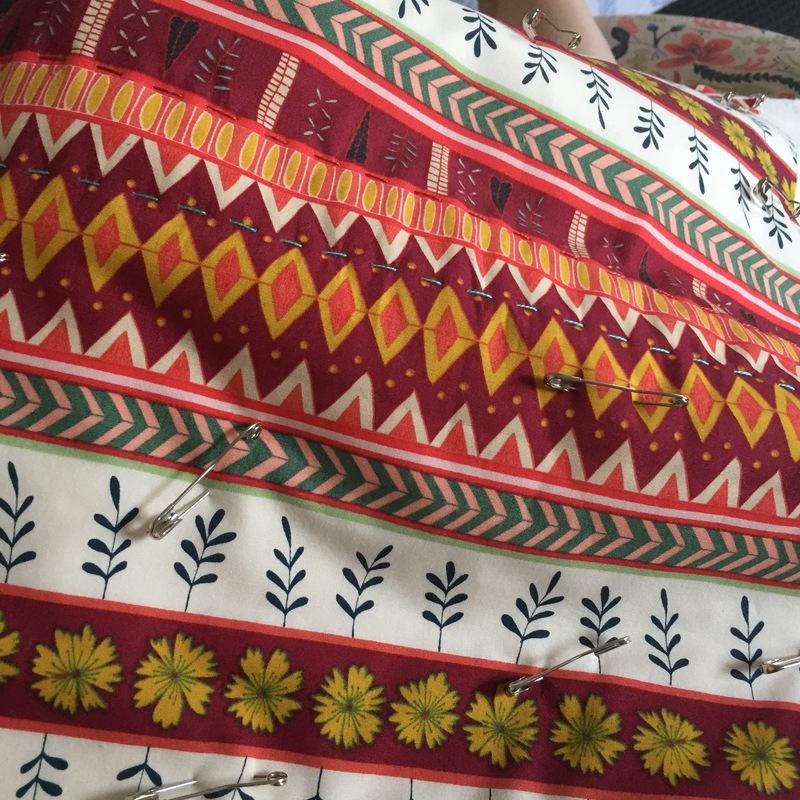 I felt a pang of envy – an almost physical pain – when I heard about this hand quilting workshop by Felicia Semple (of The Craft Sessions fame) that is taking place soon in Victoria. 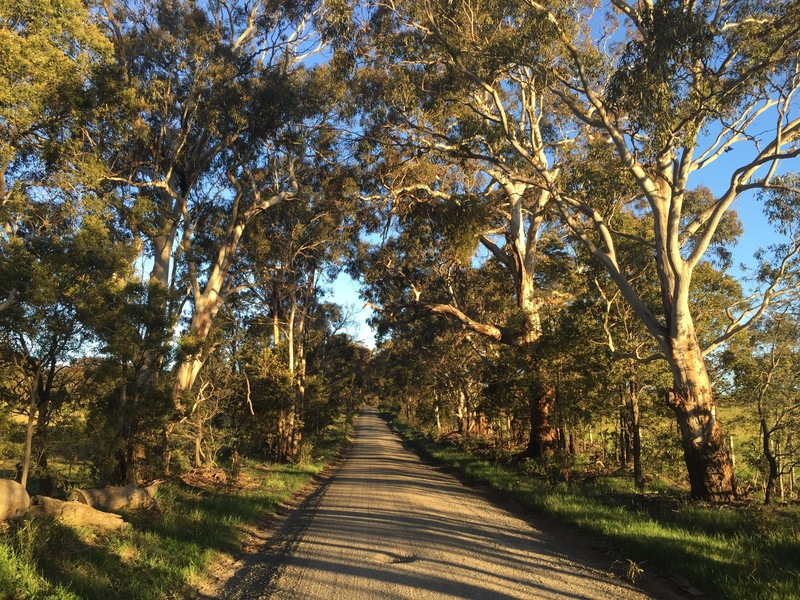 Like outside-of-Melbourne Victoria, i.e., a very long way from me. While I could potentially twist the household budget enough to fly to Melbourne and get to Lauriston and do the workshop, it’s not something the budget can extend to often, and I think my travel/crafty budget has probably already been exceeded this year. Not to mention the fact that I’ve only ever spent one night away from my children. And while I know that plenty of parents do leave their children regularly for a night or two, it’s not something that I feel very comfortable doing, at least not yet. So there are some good reasons why I won’t be at the workshop, much as I would deeply love to be. I’ve thought about it a lot this week and I think it boils down to a crafty version of FOMO, fear of missing out. The oh-so-very-2016 fear that other people elsewhere are doing better, or more interesting, or more exciting things than you are. The truth is, I would really love to know how to hand quilt, but I’m a bit afraid. I’ve read about it, and I’ve watched Anna Maria Horner’s Creativebug class more than once(! ), but I’ve never seen anyone do it in person. When I look at pictures like this I have about a million questions. (1) I want to know how to hand quilt. I love the look of the finished product so much, and even more than that, I am curious to try the slow pace of the stitching itself. It appears soothing. Old-fashioned in a good way. (2) I probably have everything that I need (and then some) to try hand quilting already. If it’s really what I want to do, why haven’t I done it yet? Fear, maybe? In the form of perfectionism, and the desire to do everything right the first time? Prioritising other things in my life that I feel I should do, rather than want to do? All of the above? (3) I wish there were craft workshops like this in Brisbane. Maybe I could organise one. (4) Quilting with Nani Iro fabric = sheer genius. Why didn’t I think of it before?? (5) I wonder what kind of other materials Felicia Semple uses (fabrics, needles, thread, batting)? I would love to know. Looking at these things written down, it doesn’t seem so frightening. I’m going to email Felicia to ask what she uses (you never know your luck! ), and, more importantly, it’s a long weekend this weekend, and I’m going to make a pact with myself to start a hand quilting project by the time Tuesday morning rolls around. I’ll report back. 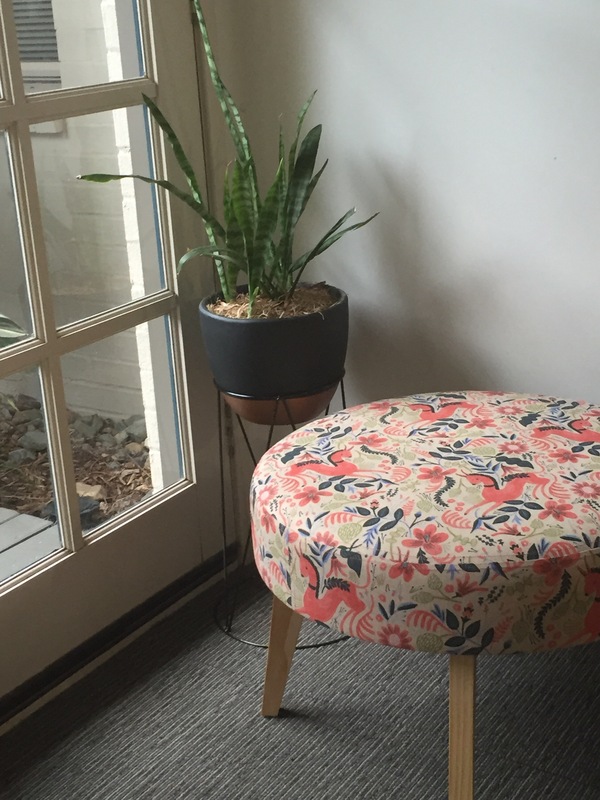 So I made an ottoman! Not on my own, but with a little help from the Ministry of Handmade, which is to say Julie and Maurice Hillier’s handmade/how-to wonderland on Brisbane’s northside. Boy, do I love that place. I’ve done two workshops there in the last few months. 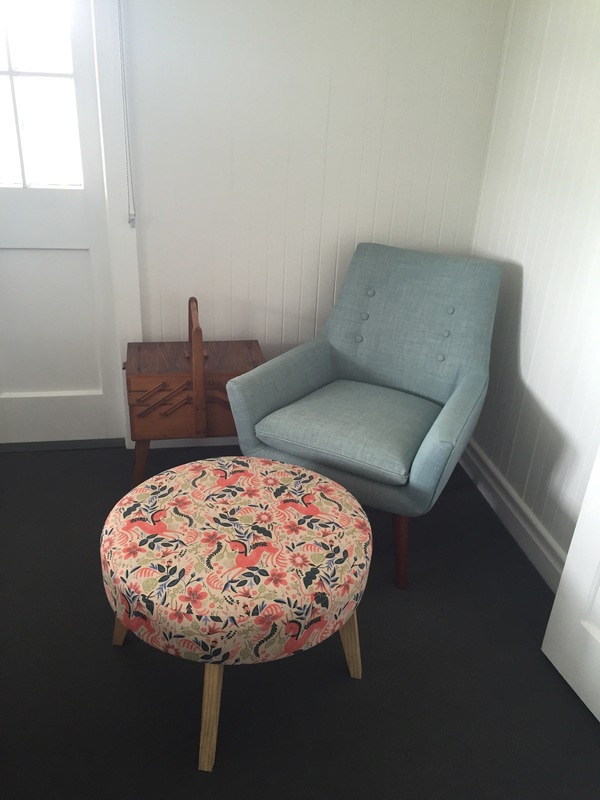 The first was the rag rug workshop that resulted in the quilt* I talked about in my last post, and the second was a couple of weeks ago, when I learnt to cover and assemble a round ottoman. 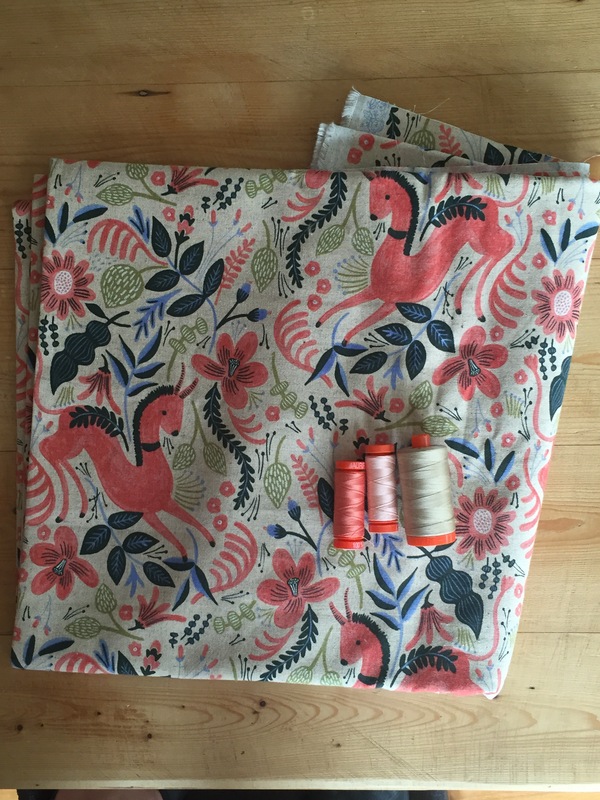 For the fabric part, I ordered this beautiful canvas – a new part of the Les Fleurs fabric line from Rifle Paper Co. for Cotton and Steel – online, and I was so thrilled to unpackage it. Sometimes things you purchase online can disappoint when you see them in the flesh (with either the quality or the colour, or, on a bad day, both), but not this. The ottoman-making process itself involved far more sewing and far less upholstering than I imagined, so it was interesting to see it all come together. I learnt that the fabric covering an upholstered surface needs to be EXTREMELY taut – tight even – to look good. So that meant a lot of trips back and forth to the sewing machine. I also learnt that air staple guns are kind of fun. And noisy. 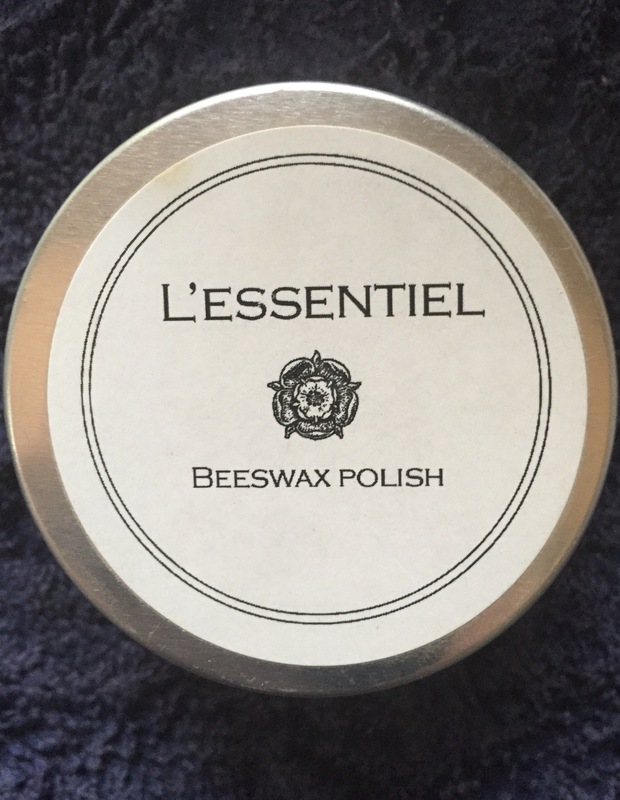 And I fell in love with this furniture wax we used – it smells like Christmas(!) and made me want to wax all the things. I see more of this in my future. I feel a little silly because the corner that I envisaged the ottoman going in is kind of too small for the end result (my fault entirely: I should have measured first). I had to move a double bed to get the photo below, which is less than practical. 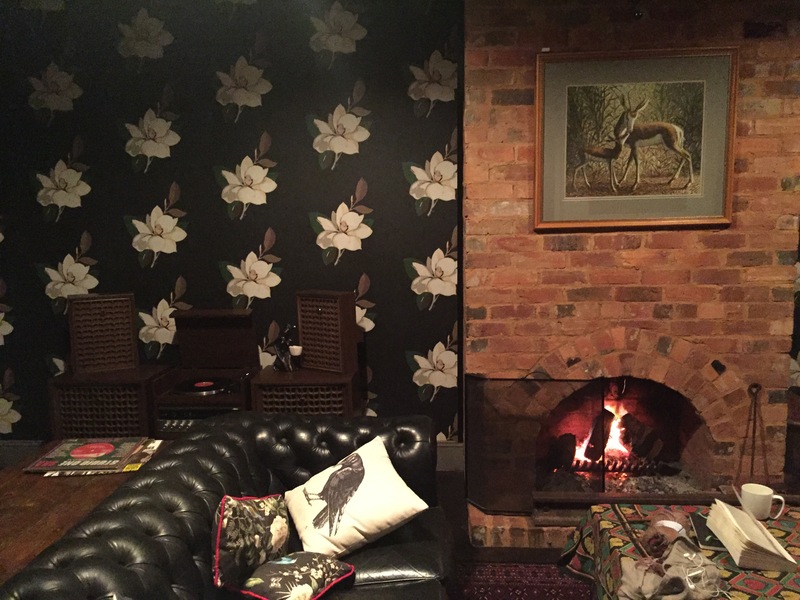 And while it would be great to use the ottoman in the loungeroom, instead of my sewing/crafting corner where I had planned, it really needs to be in a different fabric to fit in there. So now I either need to move some furniture around, or recover the ottoman, or live with a combination of colours that makes me unhappy. I’m not sure yet how that will get resolved, but I’m sure there’s a lesson for all of us in there somewhere!